There is a place for everyone to serve and be served at Our Lady of Victory. Some of the opportunities available are listed below. If you have questions or would like more information, please don't hesitate to contact us. Ministers of Holy Communion are those members of the parish who assist our priests and deacons in the distribution of Holy Communion at Mass. They may also distribute the Eucharist to the sick at home, in hospitals or nursing facilities. Eucharistic Ministers must have received the sacrament of Confirmation. Individuals selected must distinguish themselves by their Christian life, faith and morals. They are called to a devotion to the Holy Eucharist and should be an example to the other faithful. Specific instruction is required for every person who becomes at Eucharistic Minister. 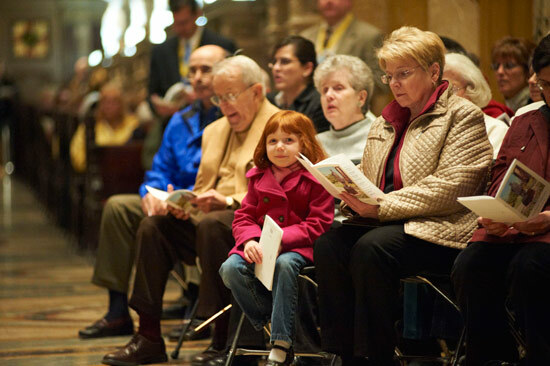 Young adults and adult parishioners are invited to exercise the ministry of lector, reading the Scriptures at Mass and other liturgical services. Lectors should be confirmed and will receive training at our parish for this ministry. To serve as a lector, please call the rectory at 828-9444. 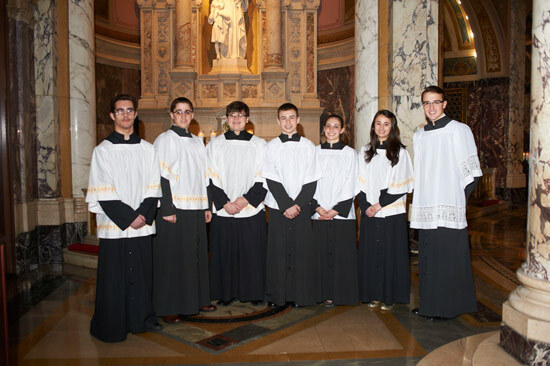 Our Lady of Victory Basilica Choir is a volunteer group of men and women drawn from among our parishioners and other interested singers in our community. 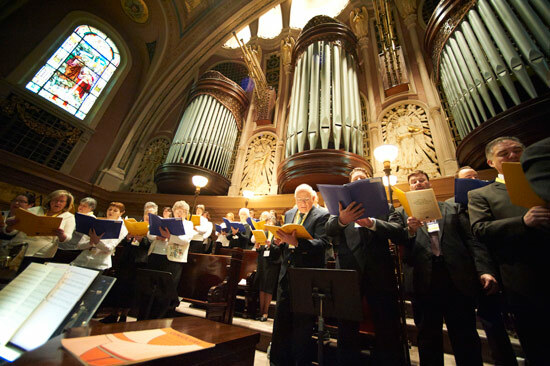 In addition to leading the congregation in song, the choir strives to sustain the rich choral tradition of our Catholic faith, from chants of the early church through the harmonies of the Renaissance and Baroque styles to modern compositions. Music sung by the choir is selected as appropriate to the liturgical season, as well as to the liturgical action taking place. In short, the choir provides music to enhance the worship life of our parish community. Occasionally, the Basilica choir joins the choirs from other parishes to sing for Diocesan events or to socialize with singers from other parishes. The Basilica Choir rehearses Thursdays at 7:00 p.m. in the Music Room located in the lower Basilica, and sings for Noon Mass on Sunday, as well as for special services such as Christmas Midnight Mass, Confirmation and certain Holy Week Masses. Members of the choir are people who care about the quality of our parish liturgy, expressing their faith through sung prayer. While Our Lady of Victory is blessed with a very fine choir, we are continually looking to our parish community for new members in order to maintain the strong and vital musical organization. While no formal training in music is required, Choir members do need to be dedicated and loyal to their commitment. Contact the Rectory or see the organist after one of the weekend Masses for further information. The main function of these groups is to add praise and prayer through music to the liturgies celebrated in our community. Guitar, flute, and keyboard are used and the music reflects the style of these instruments. The group consists of 25 members at present and is divided into two sections which alternate Sunday Mass on a monthly basis. The Contemporary Music Groups also serve the community at weddings, funerals and special Masses during the church year, as well as various other functions sponsored by the Diocese. Practices are held on Saturday mornings at 11:00 a.m. for one group, and Monday evenings at 7:00 p.m. for the other. Some basic understanding of music, guitar, or an ability to sing is all that is required. Other instruments are welcome, as well. Our ushers greet parishioners as they enter church, assist in seating and taking up the collection. Meetings are held as needed. This group invites new members and is particularly interested in gaining the participation of the teens and young marrieds of the parish. Both men and women are invited to join. Any child who has made his or her First Communion is welcome to become an altar server. When training has been completed, individuals will be assigned to serve Mass on a regular basis. This is an excellent opportunity for young children to become active members of our faith community. Contact the Rectory for more information about training. The overall goals of the liturgy group are to prepare Masses for Feasts and Liturgical Seasons. This group represents artists, ushers, servers, Eucharistic Ministers, musicians and other liturgical ministries. The Committee meets monthly. This ministry assists parents in the religious education of their children. There are classes available for Kindergarten through 9th Grade, Special Education, and Confirmation Preparation classes for high school students from both public and private schools. Teachers, assistant teachers, office helpers and other volunteers are always needed and welcomed. Please contact the Religious Education Office at (716) 828-9437. This organization provides emergency assistance to the needy. Our Conference is affiliated with the Diocesan Council of St. Vincent de Paul Society, which is international in scope. Membership is open to both men and women and is by nomination, with the advice and consent of the Pastor. Meetings are held at 7:00 p.m. every other Tuesday in the Rectory. Assistance is offered to families with temporary difficulties caused by lost employment, suspended welfare payments, etc. These appeals usually come through the Rectory or directly from a member. Home visits are normally made by two members of the Society. Assistance is in the form of groceries from a pantry maintained by the society from contributions and/or purchases at reduced cost through the cooperation of local markets. Furniture and appliances are sometimes provided through the Diocesan store or donations. Each Thanksgiving and Christmas, there is an extensive distribution of food parcels and certificates with some toys for the children. A voluntary contribution is taken up at each meeting and the church poor boxes provide a further source of funds. There is one church collection each year at Thanksgiving, and many parishioners contribute generously on a regular basis. The aims of this society are to maintain the altar, the dwelling place of Our Lord, and to promote devotion to our Blessed Mother through prayers, especially daily recitation of the Holy Rosary. This society helps to purchase and maintain altar supplies, vestments and items for liturgy, holding bake sales and other fundraisers for this purpose. There is a monthly Mass at Noon, and all members are asked to participate. The Society enjoys membership in the National Council of Catholic Women. The Victory for Christ Prayer Group meets every Tuesday at 7:30 p.m., with Mass on the first Tuesday of every month. Services are held in the Chapel in the lower level of the Basilica. Each service includes praise, prayer, witness and Mass with fellowship to follow. The group sponsors seminars, guest speakers and healing services. Voluntary contributions (love offerings) are accepted to help the work of the group. From these contributions, financial assistance is given to various ministries. It is not necessary to join this group; everyone is welcome to come and worship. The Catholic Daughters of the Americas, Court Monsignor Baker, cordially invites the women of the parish to become members. The Catholic Daughters' motto is Unity and Charity, and they undertake many activities in the community putting this motto into action. If interested, call the Rectory for more information. The aim of this organization is to increase personal holiness through the imitation of the virtues of Mary and to undertake various apostolic works. Each member is obligated to say the Rosary and special Legion prayers daily. Members meet on Thursdays at 1:15 p.m. Each member is asked to perform at minimum of two hours of apostolic work each week. Young men of the parish are invited to join the parish Boy Scout Troup. Scout-aged students can call the rectory for more information on joining. The Respect Life Program proclaims the sanctity and value of human life as a gift of God and the foundation of human dignity. It alerts parishioners to information, programs and liturgies which highlight human dignity and life issues. Our Lady of Victory National Shrine and Basilica offers guided public tours to share the artwork and architecture of the Basilica, as well as discuss the life and works of Father Nelson Baker. Our Lady of Victory relies on volunteers from the parish to serve as guides. If you are interested in training as a tour guide, please call Dianne Bosinski, at (716) 828-9424. Our Lady of Victory Gift Shop has greatly expanded in recent years and now offers a wide selection of items for all occasions. The Gift shop is staffed by volunteers from the parish. If you would like to volunteer, please call (716) 828-9433. Current hours are 10:00 a.m. to 4:00 p.m.